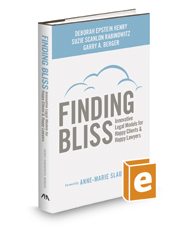 Published by the American Bar Association (ABA), Finding Bliss: Innovative Legal Models for Happy Clients & Happy Lawyers provides creative and disruptive solutions to address the stress that lawyers experience, and to improve their daily lives, and the delivery of their legal services. Change has come to the legal profession, as never before. Once-hallowed law firms face unprecedented financial pressures. Their corporate clients are negotiating rates and reducing their outside counsel spending. They are also demanding more predictability in pricing, increased flexibility in staffing, and added value from all legal service providers. Lawyers themselves, overworked and worried about job security (if they are lucky enough to have a job), are more stressed and anxiety-ridden than ever. Authored by the three cofounders of Bliss Lawyers, a secondment firm that is transforming the way corporations and law firms engage high caliber attorneys, the book provides compelling examples of how to achieve greater success – in terms of profitability, productivity, and satisfaction. In a ground-breaking analysis, Finding Bliss addresses the profession's challenges from both sides of an evolving equation: the structural change within law firms, in-house legal departments and other legal service providers, and the individual change in today's attorneys seeking to meet business needs while gaining more flexibility and freedom. Through the book's seven themes, Finding Bliss tackles the answers to how traditional and new model firms can more effectively deliver legal services and align the skills of the legal talent pool to better meet clients' needs. Anne-Marie Slaughter wrote the book's foreword and the book includes contributions from New York Times best-selling author Gretchen Rubin and the General Counsel of Verizon, McKinsey, and Nielsen. Additionally, the General Counsel of General Electric and The Gap, as well as the President of Yale University and New York Times best-selling author Claire Shipman, have provided testimonials on the book's back cover. The endorsement by these thought leaders is a tribute to the book's insightful content and the vision of its coauthors. With a combination of innovative foresight and penetrating understanding, Finding Bliss provides wisdom and inspiration of how to successfully navigate this critical moment of upheaval and opportunity facing the legal profession. The result? Happy clients and happy lawyers.